Calculate how many rolls/meters you need of the pattern. Pattern repeat and waste are taken into account. Note: the result is indicative, not an exact calculation. The Roaring Twenties: the decade that will forever be known for the rise of radio, cinema and jazz music. Fashion is provocative and interiors more opulent than ever before. Fast-forward to the present day, where the luxurious new palazzo style is an unstoppable trend. We see many typical Twenties elements making a comeback, although in contemporary form. That combination of new palazzo and the lavish style of the Twenties forms the inspiration for the Insolence collection. 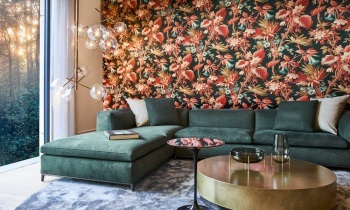 Fil-à-fil wallcovering with a soft velvet touch. The design is based on an authentic drawing from the beginning of the 20th century, but in a very modern version. 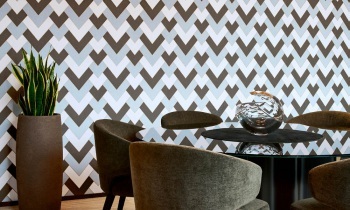 The colours are striking and contemporary, the pattern itself is faded, giving it a bleed effect. 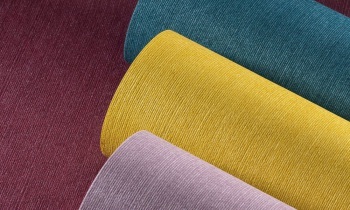 The fil-à-fil effect, which is woven into the core of the product results in a truly unique plain wallcovering. You can see this very well by looking at the back. 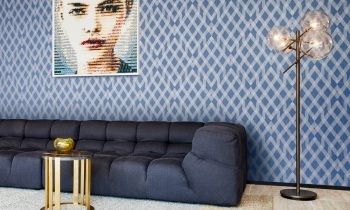 This technique makes the textile effect on the wall very realistic. Inspired by the flamboyant Charleston dresses! 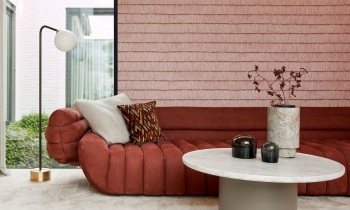 Fringes are literally everywhere again: in fashion, jewellery, handbags and in modern interiors. Make your choice of non-woven with a realistic textile effect (pattern Shiver) or authentic fil-à-fil with soft velvet touch (pattern Swing). 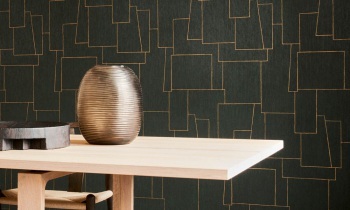 A modern herringbone inspired by the Gatsby style, with a fine line in metallic gold. A trendy interpretation of the classic terrazzo floors, which are undeniably making a comeback in our interiors. This design fits perfectly into the layering trend. The pattern is simplistic, but you can look at it for ages. Which plane came first? A design inspired by classic, wrought-iron collapsible lift doors. You can still see them occasionally in hotels in the heart of Paris.